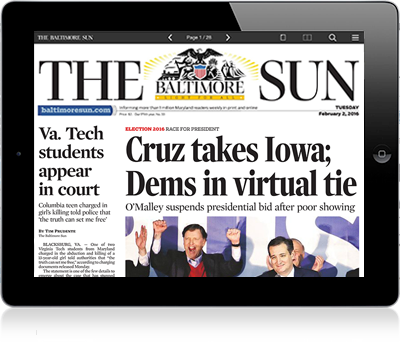 Get The Baltimore Sun delivered to you whenever and wherever you are. Subscription includes premium content, eNewspaper and exclusive offers. Subscribers, your print subscription includes Unlimited Digital Access at no extra cost.Click here to activate. BaltimoreSun.com has been digitally remastered to fit your life. Unlimited Digital Access is your all-access premium content pass to comprehensive local news, entertainment, sports and commentary. Subscribe today to start taking advantage of Unlimited Digital Access. Activate Unlimited Digital Access Today! Enjoy our distinctive and award-winning storytelling, investigative reports, commentary, in-depth local news including extensive coverage of our local and high school sports teams, signature blogs, compelling photo galleries and original video content. Mike Preston wrote the story on the Ravens’ first game in Baltimore in 1996, and he has been covering the team ever since. The Kenwood High and Towson University alum has been writing for The Sun since 1987, and he has been a columnist since 2000. In addition to the Ravens, Mike also covers local and national college lacrosse. The Darkroom, the photography and video blog of The Baltimore Sun, shines a light on visually captivating stories of our past and present. It showcases the exciting work of our staff, offers tips in the craft, and highlights the emerging community of independent media makers. 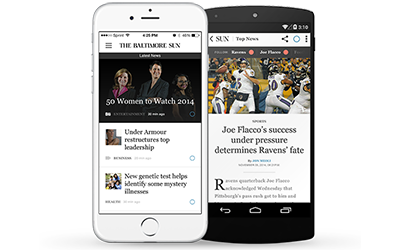 Whether you're at home, at work, or on-the-go, your Baltimore Sun will never be further than a click away. The eNewspaper is a replica of the print paper, with features such as search, clip and save or email, 30 day archives, translation, video and more. Download today's paper onto your mobile device for easy viewing anywhere. Register for free to Baltimore's Sun Insider which provides both digital and print subscribers with money-saving coupons, contests and discounts on entertainment, sporting events, dining and other services. Additionally, you can rely on the Baltimore Sun Store for unique and exclusive items connected to this great city we are all so passionate about, Baltimore! Enter by September 30, 2016 for a chance to win the ultimate Universal Orlando™ Resort vacation! You could win a 3-night trip for four to experience both Universal Studios Florida™ and Universal’s Islands of Adventure™ theme parks! The Little Italy Open Air Film Festival, a Baltimore summertime tradition since 1999, will not take place this summer, organizers announced Saturday. “I have just learned that there will not be a film fest for 2018,” Suzanna Rosa Molino, director of the Promotion Center for Little Italy, said in an email Saturday morning. For almost two decades, outdoor films had been shown on Friday nights in a parking lot of Da Mimmo Restaurant at High and Stiles streets, projected from a home across the street. Last month, organizers announced that the festival, for its upcoming 20th season, would be moving to a new location, in a parking lot of Stratford University. Mary Ann Cricchio, owner of Da Mimmo and one of the festival’s original organizers, said she no longer spends summers in Baltimore and could not take on the responsibility of running the festival. The post did not say whether there are plans for the festival to return in 2019. In top workplaces, success is defined by more than the bottom line, and when employees work for more than a paycheck, success often follows. Now there's a simple way to get personalized content on your phone and tablet. Take Baltimore Sun with you. Whenever you want. Wherever you go. • Explanatory criminal justice and courts reporting from Sun journalists Justin Fenton, Justin George, Kevin Rector and Alison Knezevich. • Our Maryland Politics blog, your source for political news and intelligence from the Mason-Dixon line to the Potomac. • Up-to-the-minute breaking news coverage from Baltimore Sun Media Group staffers. • Real estate, gambling and consumer interest news from our business desk. • Maryland Voices: Staff editorials, letters to the editor and commentary from writers across the country. • Data-driven projects, interactive applications and online presentations from The Sun's interactive design team. • The Sun's investigative team keeps Maryland readers informed and leaders of institutions in check with award-winning watchdog journalism. • The latest Ravens news, notes and analysis from beat reporter Jeff Zrebiec. • Hot Ravens takes from veteran Sun columnist Mike Preston. • Orioles news, notes and analysis from Camden Yards by Eduardo A. Encina, Jon Meoli and Peter Schmuck. • Tracking the Terps: Don Markus brings you the latest basketball and football news from College Park. • Baltimore Sports Blitz: Irreverent commentary on the Ravens, Orioles and Terps from Jonas Shaffer. • Catching Up With: Longtime Sun sportswriter Mike Klingaman talks to Baltimore sports stars of yesteryear. 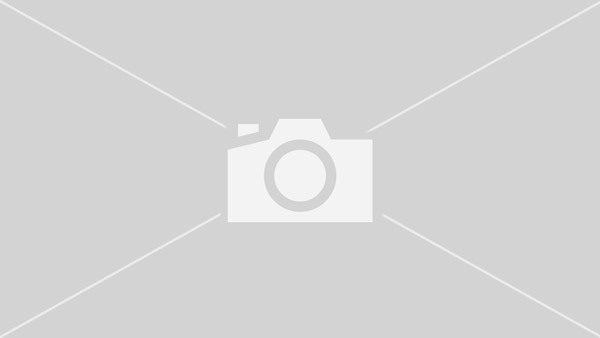 • High school sports coverage on our Varsity Letters blog. • Want the latest news and reviews from Baltimore's after-hours scene? Wesley Case has you covered at Midnight Sun. • Baltimore Diner has restaurant news as well as Maryland eats, drinks and cooking from The Sun's Sarah Meehan. • Longtime Sun critic David Zurawik's often biting, often hilarious takes on the business and culture of television. • At Baltimore Insider, you'll find celebrity news and notes on Maryland personalities and politics from reporters Brittany Britto and Quinn Kelley.